Here’s an update I promised a few months ago when I wrote my first post about how my DMs Guild products were fairing. That article generated a lot of interest and questions about how the DMs Guild works and how my pay what you want products were faring since. I figured this was a good time to once again lift the curtain and share my sales information with you. If you want to find out why many of my products are pay what you want, read that previous post. The TL;DR version is that it’s material I first released on the blog before the DMs Guild or fifth edition Open Gaming License was in effect. I promised that material would always be available for free and I intend to keep that promise. First here’s a look at the total number of times my DMs Guild products have been purchased including free and paid downloads. Here’s just the paid downloads. Note: Tarokka Expansion is a paid product only and a recent release. Greater & Elder Elementals began as pay what you want and is now a free product. It’s no surprise (especially if you read the previous post) that most people choose to pay nothing for the product given the choice. You can see just how huge the difference is on the charts. You can also see that people who do pay for my products generally pay less than $2 no matter the content or size of the product. Don’t freak if your product has the number of sales it needs to achieve a metal, but hasn’t received it yet. 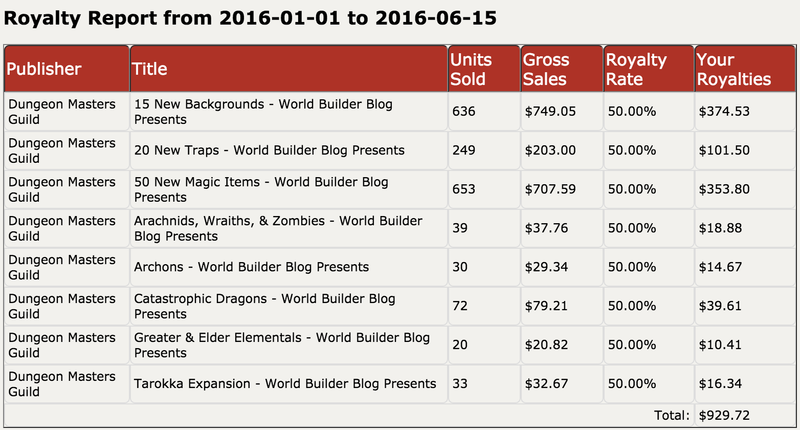 It seems the DMs Guild takes a day or so to update metals and sales rankings for products. At the moment I have metals for 15 New Backgrounds (Gold), 50 New Magic Items (Gold), 20 New Traps (Silver), and Catastrophic Dragons (Copper). As you can see from my sales, the platinum best sellers above, and the list of the 40 current top sellers products that are good for both dungeon masters and players sell best. New classes, archetypes, races, and feats do very well. My own top sellers are magic items and backgrounds. Products that speed up play, like spell cards, cheat sheets, lists of names, and maps, also sell. The occasional adventure (usually if it’s written by someone with a little name recognition) gets up there but there are many well written adventures on the guild that get outsold by the stuff that’s good for players and DMs. Not shown on the list above are the Adventurers League adventures that also do very well. Of the 30 gold best sellers on the DMs Guild, 17 are Adventurers League adventures. It definitely pays to have the support of organized play. My own experience is really interesting as far as what people pay for. 50 New Magic Items is far and away my top purchased products. It’s got almost 400 more than the next best seller, 15 New Backgrounds. 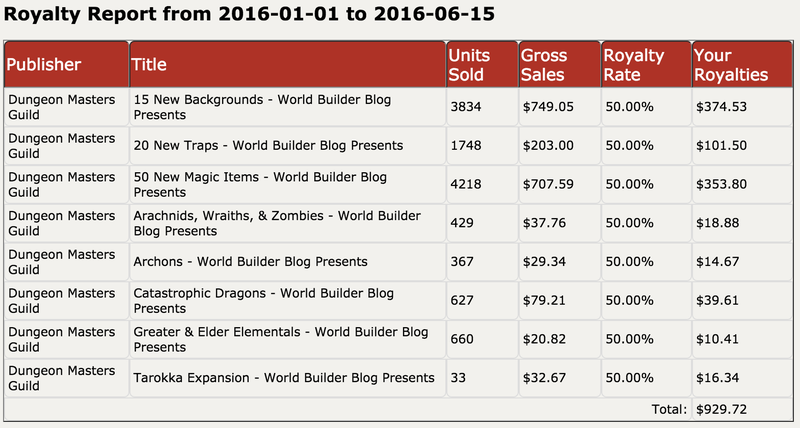 Yet 50 New Magic Items only has 17 more paid sales and actually made $40 less in total sales than 15 New Backgrounds. I can’t say why my top seller isn’t my top money-maker. Maybe it’s because people think it takes less effort to design 50 magic items than it does 15 backgrounds, but that’s not true (and these products are both more than just what’s in the title). 50 New Magic Items is 29 pages and 16,208 words and people who paid for it paid $1.08 on average. 15 New Backgrounds is 19 pages and 12,494 words and people who paid for it paid $1.18 on average. After that people paid for 20 New Traps, probably because the Dungeon Master’s Guide is so light on traps. People paid $0.82 on average for the 8 page, 4,492 word product. As you can see, even with two gold best sellers, I’ve made less than $1000 total. My work on the DMs Guild has garnered me way less than $0.01 a word. A lot of this is work I had ready to go on this blog that I had done for free, so I’m happy to have anything for it but just remember that you’re not going to break the bank with pay what you want products on the site. What Does Wizards of the Coast Like? There is one other factor I want to talk about related to Wizards of the Coast. Every other month they highlight a few DMs Guild’s product in their Unearthed Arcana Dungeon Master’s Guild Preview. These articles seem to give people a nice boost in sales. The D&D team appears to like highlighting very creative, out-of-the-box products in these articles, like Blood Magic and Darker Gifts. So get out there, get creative, and get writing! thanks for posting, that’s really insightful. I really wish the DMs Guild had a feature where you could go back and pay more or “Tip” on a previous purchase. I’ve bought a couple of things I was skeptical about in the beginning, due to poor preview options, but absolutely loved after reading through and would have gladly paid more upfront. You can absolutely do that for PWYW products. Just buy them again. Thanks again for the info, and congrats on all the success! One thing I’m curious about these days is – is the DMsGuild extra 15% worth it… meaning is there a bigger or better targeted audience, would similar products clearly sell 15% more on DMsGuild vs other outlets, etc. I am super curious about that too Tony. Do things do better on RPGNow? Tabletop library? Your own site or through Amazon? I don’t have enough products out there to know and you can’t compare the same products on DMs Guild with other places since DMs Guild is exclusive. But you CAN do that on the DMs Guild with PWYW products. Just buy it again and pay what you want to add. Yes, the customer can do that but the system doesn’t prompt it. A little prompt makes a big difference.